RUFUS CONVENTION FASHION – 10 PIECE PIN-STRIPE SUIT MADE BY TONNER FOR MATT O’NEIL – BUT WILL FIT RUFUS AND MANY OTHER MALE TONNER DOLLS. THE FIRST PHOTO IS FROM THE WESITE. THE REST ARE OF THE ACTUAL ITEM YOU WILL RECEIVE. THE TONNER SITE SAYS THIS. An exclusive from the Steampunk Gone Wilde Event at the 2010 Tonner Convention! Rufus is definitely back and with a new Steampunk look! Light brown hair and inset brown eyes, with hand painted details. 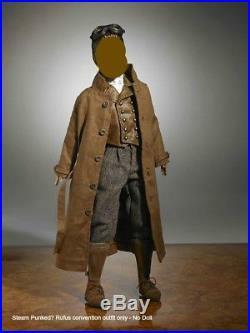 He comes dressed in his own unique steampunk style outfit including tweed pants, shirt, vest, long coat with a gear applique, shoes, shin guards, cap, and steampunk-style goggles. Designer stand also included. LE 125 and hand signed by Robert Tonner! THESE ITEMS ARE FROM MY PERSONAL COLLECTION. I LOOK FOR ANY IMPERFECTIONS AND, IF I FIND ANY I WILL NOTE THEM. LOOK VERY CAREFULLY AT THE PHOTOS AND READ THE BODY OF THE DESCRIPTION BEFORE PURCHASING. The item “STEAM PUNKED RUFUS CONVENTION OUTFIT, FITS MATT AND OTHER MALES, TONNER” is in sale since Monday, February 05, 2018. This item is in the category “Dolls & Bears\Dolls\By Brand, Company, Character\Tonner\Other Tonner Dolls”. The seller is “pattygail5300″ and is located in Mission, Kansas. This item can be shipped to North, South, or Latin America, all countries in Europe, Australia, Japan, China, South Korea, Indonesia, Taiwan, Thailand, Hong Kong, New Zealand, Philippines, Singapore, Malaysia. RUFUS CONVENTION FASHION – 10 PIECE PIN-STRIPE SUIT MADE BY TONNER FOR MATT O’NEIL – BUT WILL FIT RUFUS AND MANY OTHER MALE TONNER DOLLS. THE FIRST PHOTO IS FROM THE WESITE. THE REST ARE OF THE ACTUAL ITEM YOU WILL RECEIVE. THE TONNER SITE SAYS THIS. An exclusive from the Steampunk Gone Wilde Event at the 2010 Tonner Convention! Rufus is definitely back and with a new Steampunk look! Light brown hair and inset brown eyes, with hand painted details. He comes dressed in his own unique steampunk style outfit including tweed pants, shirt, vest, long coat with a gear applique, shoes, shin guards, cap, and steampunk-style goggles. Designer stand also included. LE 125 and hand signed by Robert Tonner! THESE ITEMS ARE FROM MY PERSONAL COLLECTION. I LOOK FOR ANY IMPERFECTIONS AND, IF I FIND ANY I WILL NOTE THEM. LOOK VERY CAREFULLY AT THE PHOTOS AND READ THE BODY OF THE DESCRIPTION BEFORE PURCHASING. 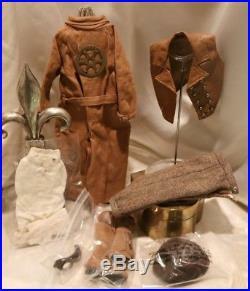 The item “STEAM PUNKED RUFUS CONVENTION OUTFIT, FITS MATT AND OTHER MALES, TONNER” is in sale since Thursday, January 25, 2018. This item is in the category “Dolls & Bears\Dolls\By Brand, Company, Character\Tonner\Other Tonner Dolls”. The seller is “pattygail5300″ and is located in Mission, Kansas. This item can be shipped to North, South, or Latin America, all countries in Europe, Australia, Japan, China, South Korea, Indonesia, Taiwan, Thailand, Hong Kong, New Zealand, Philippines, Singapore, Malaysia. RUFUS CONVENTION FASHION – 10 PIECE PIN-STRIPE SUIT MADE BY TONNER FOR MATT O’NEIL – BUT WILL FIT RUFUS AND MANY OTHER MALE TONNER DOLLS. THE FIRST PHOTO IS FROM THE WESITE. THE REST ARE OF THE ACTUAL ITEM YOU WILL RECEIVE. THE TONNER SITE SAYS THIS. An exclusive from the Steampunk Gone Wilde Event at the 2010 Tonner Convention! Rufus is definitely back and with a new Steampunk look! Light brown hair and inset brown eyes, with hand painted details. He comes dressed in his own unique steampunk style outfit including tweed pants, shirt, vest, long coat with a gear applique, shoes, shin guards, cap, and steampunk-style goggles. Designer stand also included. LE 125 and hand signed by Robert Tonner! THESE ITEMS ARE FROM MY PERSONAL COLLECTION. I LOOK FOR ANY IMPERFECTIONS AND, IF I FIND ANY I WILL NOTE THEM. LOOK VERY CAREFULLY AT THE PHOTOS AND READ THE BODY OF THE DESCRIPTION BEFORE PURCHASING. 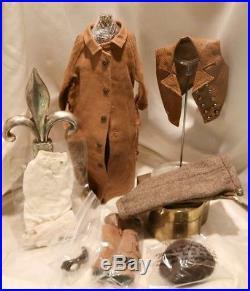 The item “STEAM PUNKED RUFUS CONVENTION OUTFIT, FITS MATT AND OTHER MALES, TONNER” is in sale since Sunday, December 31, 2017. This item is in the category “Dolls & Bears\Dolls\By Brand, Company, Character\Tonner\Other Tonner Dolls”. The seller is “pattygail5300″ and is located in Mission, Kansas. This item can be shipped to North, South, or Latin America, all countries in Europe, Australia, Japan, China, South Korea, Indonesia, Taiwan, Thailand, Hong Kong, New Zealand, Philippines, Singapore, Malaysia.